Now with closure and a lot less baggage! I’ve been reading your blog for over a year and didn’t have the courage to post until today. I have never had someone describe the pain of infertility more accurately than you have. Thank you for your honesty. We adopted our practically perfect in every way baby girl 7 weeks ago. I hope she grows up to be as adorable as your Addie. OH, this is so great to read. Here’s to peace. Infertility… unfortunately its something I’m WAY too familiar with. I protested and fought it for a VERY long time and finally got to the place where I was at peace with living in the NOW and not in the someday, maybe one day, what if possibly world. I’m so glad you’re there and wish you much peace, health, and happiness! I am happy for you Casey that you are at peace with this. What an amazing post, thank you for sharing. I recently have started to find the calm & peace of knowing I will never be able to get pregnant. Even though we are beginning our adoption journey, sometimes I was still bitter. The past probably month or so, I have noticed that going away, but not until reading what you had to say, did I really realize I am at peace & understand what you mean. I wish you nothing but peace & happiness in the future. Your post encouraged me. It is awesome when you get to a place where you accept the plan for your life right now. I am an Indy girl and I am going to Blissdom. I’m so happy for you, Casey. Your Moosh has a wonderful mama! I’m an only child, and this makes me want to call my mom! This made me smile for you. “done being angry” “done being bitter” – those are amazing and hard fought sentiments. I want to get there some day. I am so. so happy for you. I know the road the the place you’re in now was no fun but the destination is worth it. This is a huge blessing. Finding peace in something this painful. I’m really happy for you. I know that infertility is really, really hard and it takes a toll. Getting to that place where you’re done with it can be such a relief if it’s the right thing, and it sounds like it is for you. Who knows? Maybe nature will decide to give you another kid. Maybe not. You and your daughter? Perfect and adorable! I am so happy that you’ve found peace. I know it will happen for you, Casey. I know it. Until then, revel in the fact there are no poo smeared walls and stinky diapers cluttering your garbage cans. Sometimes, it’s refreshing to be able to look bad and see how far we’ve come. Your happiness now is evident. I’m glad you’ve gotten to this place you’re in now. It’s a good place to be. It’s hard to be patient and I can relate to when you’re TTC…the counting days and how it’s never just monday or tuesday. I don’t often respond but I wanted to let you know that I’m so happy that you’ve gotten to this place. It’s a road that I traveled to and, you know what? After I traveled it everything else just seemed to fall in place. The hope in your voice sounds great Casey. i don’t guess there’s any other way to say it: i’m happy that you are happy. btw – you and addie GLOW in that picture. It’s good that you’re at peace. It’s hard to think that junky things sometimes have some small bit of good in them. The good? That your struggles have helped many other people; that your Moosh is a light that you do have, so regardless of if you get another light, the effervescence of her will help you through life; that (crappy as this may sound) your not being able to have a second child has helped people who DO have children realize that others aren’t as lucky. You’ve likely helped more people than you know. And personally, if you got another little bubbly Moosh 2.0? Your house would be so full of cute and adorable it just might explode. And what would that do to all the new fixtures, furniture and the like that’s there? Giant hug for you in one week. I’m cooking up my first one right now and I’m excited. A lot of my excitement comes from seeing the love that you and other bloggers have for the babies you do have! Glad you are at peace with whatever God has in store for you. You’ll be a light to a whole other group of people in the way you have been to all of us! I’m happy for you Casey. This is a beautiful post. What a beautiful post, that I’m sure was hard to write. 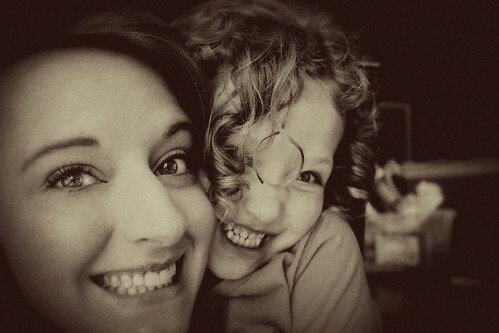 I love the photo of you and Addie. For a number of reasons, my husband and I are not going to have children. I know this is the right thing for us. But I’m still working through it. I blogged about it about this time last year (http://www.ramblingsbyreba.com/2009/03/15/the-baby-thing/). I’m more “firm” in my decision now than I was then, but it’s still not easy. I’m glad you’ve found peace. I’m looking forward to some peace of my own one day. You are incredible. So glad you’re in this place right now. I have a friend who SO needs to read this, but I’m not sure she’s ready to yet. My heart is sad for her all the time because she’s in such a bad place about trying so hard to have another baby and not succeeding. so thankful you are at peace. I’m so glad you’re happy, Casey. I recently had one of those moments where I realized how ok I am with my little family of three, too. It’s a great feeling. It also helps that we both TOTALLY hit the jackpot of cuteness with our first babies. So glad you’re at this place! It’s a good head space to be in! I have two, but I’ve always yearned for that cute little number of four since before my uterus would give a little twitch at the sight, sound or thought of a newborn. Alas, I just don’t know that that’s in the cards for me and my own finicky fertile self, and I’m okay with the two that I’ve been blessed with! That’s two more than many! I’ve read and cried along with you through your struggles, knowing how you feel. It makes my heart happy to know you’re on this side now. We’re so much more than the zip, boom, pow of our fertility!!! Is it OK if I’m not there yet for you? Can I want it really badly for you and be crushed for you instead? Hi, someone left a comment at my blog recommending your blog. My ob-gyne just dropped a bomb on me saying I have PCOS and likely not have babies anymore. I have a 6 year old girl who longs for baby sisterS and brotherS. I’ve had all the anger, jealousy (at all pregnant ladies) and longing for that sweet baby smell again. We’re still trying but when it’s all done and nothing, I hope to find closure like you did. Wow! That is an amazing place to be. It’s so hard to not be jealous when someone has something we want. I really think you have hit the key in just being content with what you have and being grateful and ok with it. That is a great place to be! this is SO me….thank you for putting into words what i’ve been feeling. we’ve had infertility plus miscarriages, yet i seem to like banging my head against that wall. maybe now i’ll get over it. this is beautiful and i read with tears filling my eyes. what a perfect place to be….contentment. and as an adoptive and biological mom (but really just a mom) i’m so thankful you mentioned to those waiting that there are other babies that need love. I am visiting for the first time, and I can’t stop reading. What I’ve experienced is nothing compared to you, but I also had a very difficult time getting pregnant and a very difficult pregnancy. I threw up every day, usually 2 or 3 times. Also lost weight and joked about bulemia. How I hated being sick and pregnant and miserable. But nothing, nothing even close to what you described. I think it’s absolutely amazing that you were willing to go through it all again for a second baby. I wasn’t, until I got pregnant unexpectedly a second time. My husband and I came around to the idea, and then I miscarried. The pregnancy I didn’t want had become the baby I really wanted. Same for my husband. We tried to conceive. I became the exact same crazy person you described. Every day was a cycle day, a day to monitor CM, or a day to test something. As you know, it’s overwhelming. Through all of that, I discovered that I haven’t ovulated in at least 4 months. Jealousy, bitterness. It’s so true. I’m looking at another month of TTC versus going back to being happy with the only child I thought I wanted. My husband wants to continue to TTC; I’m not sure I do. So anyway, I wanted to leave a comment to say thanks for being so honest. It’s nice to know that we aren’t alone in this miserable, unfair journey. What a beautiful story and it seems like one that more women go through then I had ever thought of, I guess you don’t think about it until you go through it yourself. I have an 11 year old daughter but luckily was able to get pregnant last year with twin girls, but sadly I lost them when they were born prematurely. It’s been 6 months since I’ve lost them and I am still coping everyday with my loss like today when I saw 2 year old twin girls holding hands in Target but I like you have come to peace with the journey I am taking and you’re right all those babies out there are truly gifts. Thanks for sharing your story with all of us!